One thing that stands out in our economy is the fact that everyone is looking for a value, a way or means of making their dollars go further. This rings true whether you're purchasing daily consumables for the home or planning a construction project. Those of us in the decorative concrete industry have known for years that on a construction project, the value of decorative concrete presents itself over and over again, a simple concept called "value engineering." 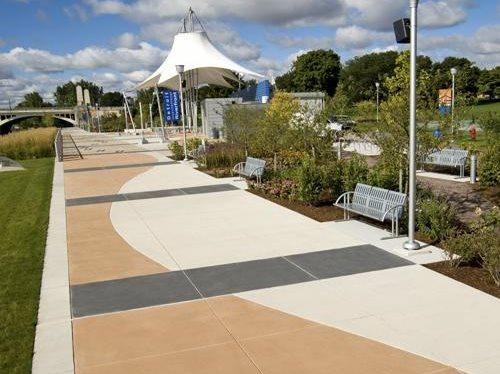 Instead of traditional masonry pavers for flatwork and pedestrian areas, more theme parks are using stamped concrete because of reduced long-term maintenance and care. Over time, pavers often become loose or they settle, resulting in tripping hazards. Replacing existing pavers with new ones can create undesirable aesthetics because the colors rarely match. No more loose or settled pavers that require resetting or replacement. The elimination of tripping hazards that increase liability for parks and resorts. Stamped concrete is safe, easy to maintain, and has a long service life. More big-box retailers are choosing decorative concrete as a finished floor as opposed to high-maintenance floor coverings or coverings that can fail due to moisture exposure. 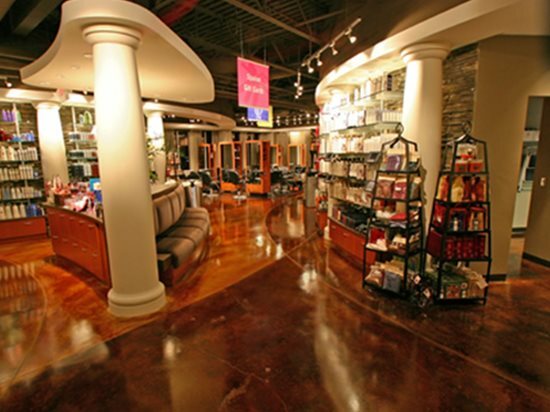 Many smaller retailers find that stained concrete floors are not only attractive but also very cost effective. Polished concrete is another popular choice for interior floors, especially in educational and medical facilities, because they create an attractive, light-reflective, easy-to-maintain durable surface. Cost savings by eliminating traditional floor coverings and using the slab on grade as the finished floor. Reduced maintenance and longer service life. Better resistance to moisture and heavy foot traffic. Another area where decorative concrete has proven to be a value to builders and developers is in the implementation of sustainable building practices. Traditional floor coverings often require adhesives that emit VOCs into the atmosphere over time, reducing the indoor air quality. Green building with concrete can contribute to sustainability in other areas as well by providing thermal mass and improving light reflectivity. Light-colored concrete pavements have also been proven to reduce the urban heat island effect by improving solar-reflectivity values. Conservation of resources. Concrete itself is made primarily from recycled materials and contributes to sustainable building. On your next construction project, try applying a value-engineering approach to your design process and the selection of materials. You'll often discover that decorative concrete is the best choice.